The participation of women in sports, whether it be professional or amateur, has increased dramatically over the past 20 years. The anatomy and physiology of the female athlete is unique and it is these aspects which are covered in this new volume in the Encyclopaedia of Sports Medicine. Women in Sport provides and invaluable reference for those who deal with sportswomen of all abilities, both on a clinical and research level. 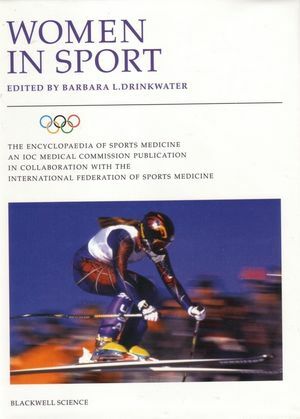 Barbara L. Drinkwater is the author of Women in Sport, published by Wiley. 1 Women and the Olympics. PART II: PHYSIOLOGY OF THE FEMALE ATHLETE. 2 Factors influencing endurance performance, strength, flexibility, and co-ordination. 3 Effects of the menstrual cycle and oral contraceptives on performance. PART III: TRAINING THE FEMALE ATHLETE. 5 Physiological aspects of training. 7 Psychological aspects of training. PART IV: THE MASTERS ATHLETE. 9 Cardiorespiratory function in masters athletes. 10 Muscle function in masters athletes. 15 Musculoskeletal injuries in female athletes. 17 Physical activity and risk for breast cancer. 22 Nutritional and pharmacological ergogenic aids. 23 Sexual harassment and abuse. PART VI: THE FEMALE ATHLETE TRIAD. 28 The young elite athlete: the good, the bad and the ugly. 30 Women's role in national and international sports governing bodies. PART VIII: SPORT-SPECIFIC INJURIES: PREVENTION AND TREATMENT. * medical issues relating to women athletes, including eating disorders, pregnancy and the effect of sport on bone and heart. This identifies the particular aspects of anatomy and physiology that makes the woman athlete unique in terms of training and clinical management. * psychosocial features of women athletes. * the masters athlete, containing information on how the body of the older athlete copes with exercise. Makes recommendations on training. * Dr Drinkwater is a past-President of the American College of Sports Medicine, and has received the prestigious ACSM Honor Award.